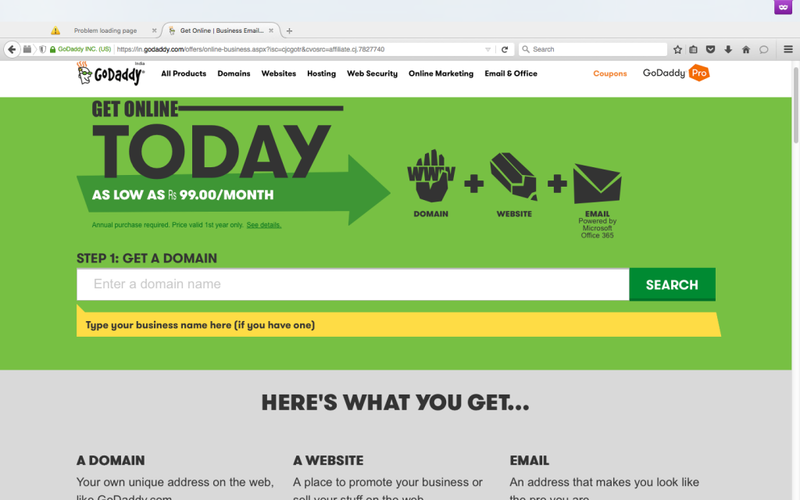 Godaddy wants that more and more people in India get online through there website. For that the company bring simplest from of website through Website builder. For this company bring a combo of Domain, Email and Website builder. Where people have to pay just Rs 1188 for one year and they will get the complete website package that will cost Rs 99 only. It may add some amount in form of local taxes. This is the best option for nontechnical people, who really want have a website with very less spending. In website builder, we can create our website with the help of templates. We have to choose one out of thousand of design, Then we can modify that as per our need. This discount is valid on the personal package only where we save around 74%, which is the very big deal by Godaddy India. We you want a complete Web Hosting package with Cpanel then give a try to Godaddy $1 Web Hosting which give you a power full web hosting with very economical budget. Annual purchase required. Pricing valid for first year only. Offer includes one .COM, .BIZ, .CLUB, .CO, .IN, .NET, .XYZ, or .ORG domain, plus Email Starter Package and either Website Builder Personal Plan or Online Store Plan (as selected by customer). This offer only provides 1 mailbox at the introductory rate. Additional mailboxes for email can be purchased at regular prevailing price per mailbox. Plus ICANN fee of ₨ 12.00 per domain per year where applicable. Cannot be used in conjunction with any other offer, sale, discount or promotion. After initial one year purchase term, products purchased through this offer will automatically renew individually at the then-current rate. For Website Builder option, the current bundle renewal price with .COM after first year is ₨ 728.01/mo. For Online Store option, the current bundle renewal price with .COM after first year is ₨ 1,838.01/mo. You may cancel automatic renewal at any time in your GoDaddy account. Geographic restrictions apply.